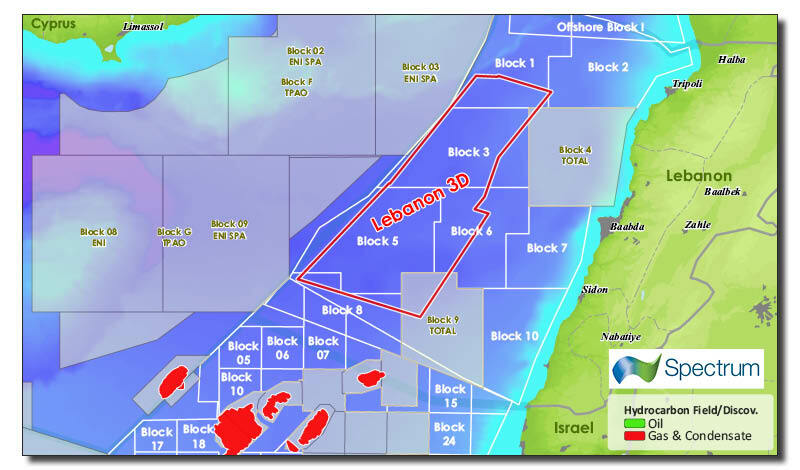 Lebanon’s imminent second offshore licence round will offer blocks with extraordinary potential. Blocks in the west display large, simple 3-way dip and 1-way fault closed structures on modern 3D seismic, where blind planar east–west faults cut long north–south folds. These features, with 400–500m of closure, enclose 1,000m of Nile-derived deepwater fan, high quality sandstone in very large traps. Whilst these are generally assumed to be filled by dry biogenic gas like the adjacent Leviathan and Zohr discoveries, actually a credible oil play from an oil-prone source rock directly underneath the reservoir suggests this undrilled acreage could make Lebanon the East Mediterranean’s oil capital. A 2017 broadband reprocessed Kirchhoff PSDM 2D seismic line extending from the shallow basement of the South Levant Platform (LHS) into the Northern Levant Basin offshore Lebanon (RHS). Vertical axis Depth in Km. Horizons: Light Brown - Mid Miocene, Dark Brown - Oligocene, Green - Eocene, Blue - Cretaceous. Map of Spectrum data and the discoveries in the area. Or so it would seem with the spate of giant biogenic gas discoveries in the Levant basin in Early Miocene sandstones and Early Cretaceous carbonate reefs over the last ten years. Yet there is a deeper mystery here, as the Jurassic, Late Cretaceous and Lower Tertiary of the Eastern Mediterranean ‘Levant’ basins all display credible oil source rocks – so why has this not been the dominant hydrocarbon phase encountered? The answer to this puzzle is pointing explorers in a most remarkable direction: away from the Southern Levant and Eratosthenes platforms and the thick Tertiary Nile Delta cone and into the Northern Levant Basin offshore Lebanon. Here, a ‘Goldilocks window’ for generation puts the primary Lower Tertiary and Upper Cretaceous source rocks squarely in the oil window, where they sit directly beneath 1 km of Early Miocene Nile-derived basin floor sandstone fans in numerous significant simple structural traps. The Eastern Mediterranean has a complex geological history. The eastern Levant is likely to be comprised of hyper-extended continental crust, and true ocean crust is probably not found east of the Eratosthenes platform, nor south of Cyprus. Of the post-Jurassic basin fill, the Cretaceous is dominated by the growth of carbonate platforms such as the isolated Eratosthenes Platform and along the margins of what is now Lebanon, Israel and Egypt. We believe that in the Late Cretaceous, a negative dynamic topographic event occurred in the Eastern Mediterranean, due to either new mantle convection cell creation or plate movement over a fixed short wavelength cell fabric. This allowed the Nile Delta, which had been draining into the proto-Niger, to begin to flow north and to bring clastics for the first time into the Mediterranean, drowning carbonate production on the margins. Oligocene coarse clastics were deposited to the south and west of the present Nile Delta, whilst Oligocene source rocks were deposited to the east; indeed, the Oligocene is a major oil source rock contributor in the Nile Delta. In the Early Miocene, thick deepwater turbidite fan complexes prograded east out across the Southern Levant platform. These mature, medium to fine grained and very high net-to-gross sands provide the reservoirs of the Israeli Tamar,Leviathan, Tannin and Kerish discoveries. With open seaway between the Mediterranean and the Persian Gulf, we expect that strong anti-clockwise contourite currents on the Mediterranean margin would have de-silted the turbidite flows. However, just north of Kerish (see map) lies the Levant Ramp, down which Early Miocene sands would have continued to prograde into the Northern Levant Basin; in fact, it is possible to demonstrate that the 250–300m Early Miocene sand sequence on the Southern Levant platform thickens to over 1 km in the Northern Levant Basin (see foldout on previous page). This is interpreted from seismic facies analysis to be a largely deepwater basin floor fan sandstone complex. Unsurprisingly, the turbidites are thickest at the basin centre and thin out toward the basin margins, so that sands are very thin in the eastern pinchout where Onasagoras-1 and Amathusa-1 were drilled in Cyprus during 2013/4. Towards the end of the Early Miocene the anticlockwise rotating African plate collided with the Turkish fold and thrust belt, closing the seaway to the Persian Gulf and allowing the Nile Delta to re-adjust its depocentre into a more westerly loci. This ended coarse clastic supply to the Northern Levant Basin, which subsequently saw mainly mudstone deposition until the Messinian event. 3D image of the top Early Miocene reservoir. Spectrum Geo. In the Northern Levant Basin two structural styles developed almost simultaneously during the Late Miocene prior to the Messinian. Long, planar and blind east–west extensional faults formed showing no listric rotation and terminating upwards either in the upper Miocene or the base Messinian and downwards in the Oligocene/Eocene. These faults are spaced 5–8 km apart (fault density is considerably less than seen in the Tamar field to the south) and hade either north or south. As the post Early Miocene sequence comprises shale or marl, cross fault seal is extremely robust. There is no expression of these faults at Cretaceous level, indicating that the Oligocene/Eocene unit is ductile, with the timing of development of ductility being of particular importance. At the same time, simple compressional folds developed on a north–south axis orthogonal to the extension. Again no expression is seen at Cretaceous level, indicating that line shortening is decolled in the ductile Oligocene–Eocene. Developed 40–50 km apart, these are not flower structures related to underlying fault systems, but simple folds developed under compression. The combination of east–west faults across the north–south folds creates a string of structures, three-way dip closed and one-way fault closed, along the axis of the folds. They range in area from 20 to 50 km2. The antiformal structure of Tamar (9 Tcfg) appears similar in size and scale to the Northern Levant structures except that Tamar is more highly faulted. A simple graphic representation of the phase and timing of hydrocarbon charge for the three candidate oil source rocks. Stratochem. The Early Miocene play in Lebanon is presented as big simple structures, with 1,000m of Early Miocene sandstone sealed by thick Late Miocene mudstones. But what of hydrocarbon charge? The adjacent discoveries in Southern Levant have generally low liquid content and light carbon isotope signature, supporting a biogenic origin. However, Tannin and Kerish fields are reported to have a higher liquid/gas ratio, suggesting at least in part a thermogenic source. On the southern Levant margin, the geothermal gradient is now known to be low, at about 20°C/km. As biogenic gas is produced by bacteria active over a specific temperature range (20–60°C), this has led to Oligocene material being attacked by bacteria for a very long period of time, providing the gas found in the Early Miocene fields. Only recently have these cultures been killed off, but the Oligocene, Eocene and Palaeocene sequence is not yet hot enough to enter the oil window in South Levant, except perhaps under Kerish. 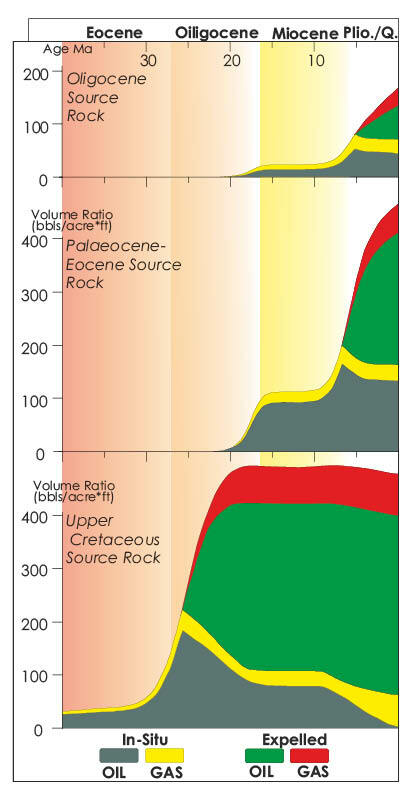 Underlying source rocks in the Late Cretaceous and Jurassic have generated oil, as encountered in the Mesozoic section in wells such as Yam-2, but it is prevented from migrating into the Early Miocene section by thick Lower Tertiary shales. To the east in Cyprus and northern Egypt, Early Cretaceous carbonate reef discoveries between 2014 and 2018 include Zohr (30 Tcf), and Calypso (6 Tcf). Prodigious volumes of biogenic gas have been sourced from the Oligocene under slow burial with low geothermal gradient. However, in the Northern Levant Basin where (assuming it displays the same geothermal gradient as seen in the Southern Levant Basin) the Oligocene and Eocene-Palaeocene sequences are in the oil generation window. To investigate this, a 3D project was undertaken by Stratochem to model the known and expected source rock hydrocarbon histories of the Oligocene, Eocene-Palaeocene and Late Cretaceous source rocks in the Southern and Northern Levant Basins. A large number of wells and Spectrum’s 2D seismic interpretation were used to constrain the model. The 3D basin model shows that, post the Messinian event, oil has been generated from the Oligocene/Eocene interval, charging overlying Early Miocene sands in structures which formed pre-Messinian. Indeed, the high liquid content of Kerish and the presence of oil slicks observed on SAR radar tell us that this basin is generating oil at present. 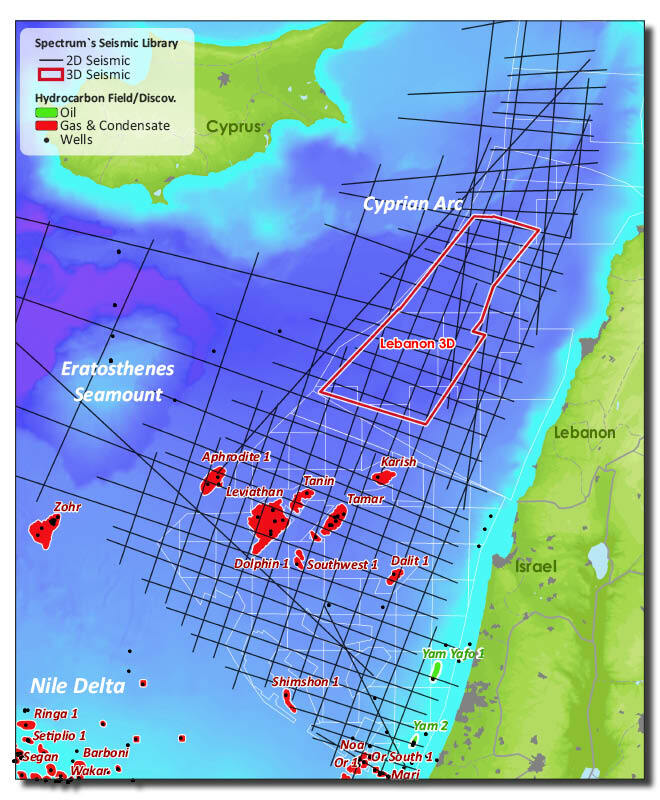 The peculiarities of copious biogenic gas flushing and immature source below structures in the surrounding basins suggest that perhaps the only place to find huge oil fields in the Eastern Mediterranean may actually be the last place to be explored – in the Northern Levant Basin offshore Lebanon. Similar GEO ExPro articles related to hydrocarbon exploration and the petroleum geology of Lebanon, Middle East. With the opening of the first Lebanese Offshore Round coming up, it is time for companies to assemble a ‘bidding dataset’ to support their evaluation of this prospective and unexplored area. Dr Munim Al-Rawi Carta Design Ltd.